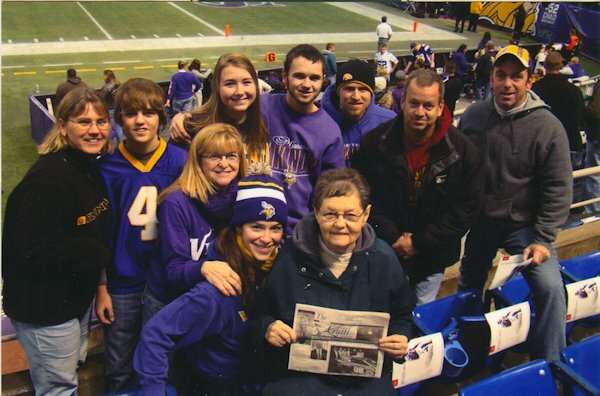 The Wetzel families took "The Quill" along to attend a Minnesota Vikings game. The happy bunch headed for Minnesota on December 15 (2013) to see the Vikings play in the dome and shop at the Mall of America. The dome has since been demolished and a new one is being built. from front left is: Abby Shumate and Ann Wetzel, and behind Abby is Gwen (Wetzel) Sones. From left back is Kris Wetzel, Nathan Wetzel, Anna Stevenson, Jacob Wetzel, Jim Shumate, Dean Wetzel and Todd Sones.